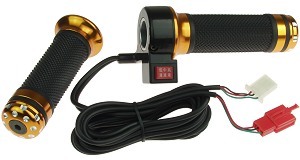 Browse for throttles by vehicle make and model. Clicking on the links above will scroll down the page to the selected throttle type. Practically all electric scooters and bikes have 7/8" (22mm) handlebars. Only a very few number of large street legal electric scooters have 1" (25.4mm) handlebars. Standard full length throttle. 3-7/8" grip length. Fits 7/8" (22mm) handlebars. Wire colors: black, red, and green. 62" long throttle cable with male terminals for white wire connectors. The most common connector for this throttle is CNX-52. Standard full length throttle with matching left hand grip. 3-7/8" grip length. Fits 7/8" (22mm) handlebars. Wire colors: black, red, and green. 62" long throttle cable with male terminals for white wire connectors. The most common connector for this throttle is CNX-52. Standard full length throttle with matching left hand grip. 4-1/8" grip length. Fits 7/8" (22mm) handlebars. Wire colors: black, red, and green. 62" long throttle cable with male terminals for white wire connectors. The most common connector for this throttle is CNX-52. Standard full length right hand throttle with matching left hand grip. 4-1/2" grip length. Fits 7/8" (22mm) handlebars. Wire colors: black, red, and green. 62" long throttle cable with male terminals for white wire connectors. The most common connector for this throttle is CNX-52. 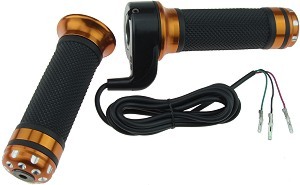 Standard full length left hand throttle with matching right hand grip. This is a true left hand throttle that goes from zero throttle to full throttle by twisting it in the clockwise direction. 4-1/2" grip length. Fits 7/8" (22mm) handlebars. Wire colors: black, red, and green. 62" long throttle cable with male terminals for white wire connectors. The most common connector for this throttle is CNX-52. 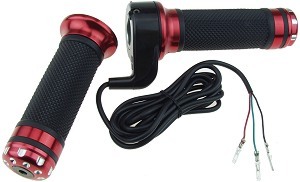 Standard premium full length twist throttle with matching left hand grip. 4-1/8" grip length. Fits 7/8" (22mm) handlebars. 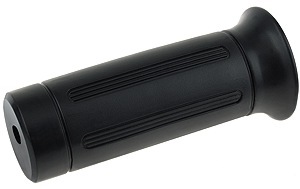 Grips have chrome-plated plastic end caps. Wire colors: black, red, and green. 62" long throttle cable with male terminals for white wire connectors. The most common connector for this throttle is CNX-52. Left hand grip with inside flange. 3-7/8" grip length. Fits 7/8" (22mm) handlebars. 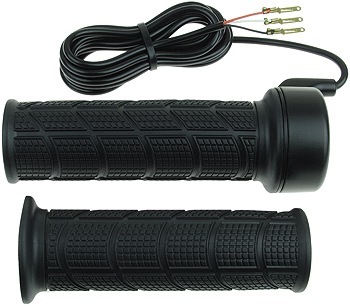 Standard full length twist throttle with anodized machined billet aluminum grip ends. Fits 7/8" (22mm) handlebars. Throttle wire colors are black, red, and green. 62" long throttle cable with male terminals for white wire connectors. The most common connector used with this throttle is CNX-52. 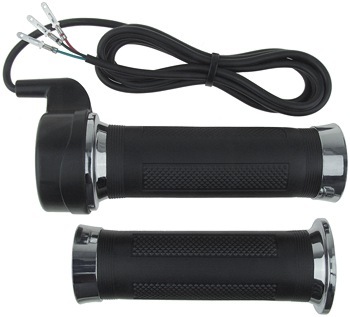 Standard full length twist throttle with anodized machined billet aluminum grip ends. Fits 7/8" (22mm) handlebars. 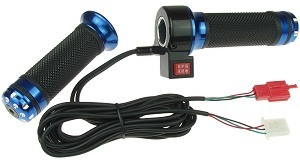 Three position switch for speed level control (low-medium-high) of brushless controllers, or can be used for turn signals or headlight switch, etc. 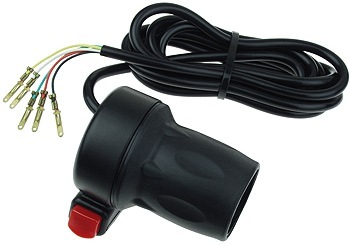 Throttle wire colors are black, red, and green with white connector. 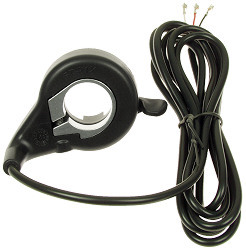 Speed level/turn signal wire colors are black, red, and green with red connector. Dual 62" long cables with two 3-terminal wire connectors. Both wire connectors mate with connector CNX-522. 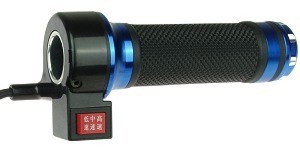 Standard full length throttle with matching grip for large street legal Chinese-made electric scooters. Fits 1" (24.5mm) handlebars. Wire colors: black, red, and white. 18" long throttle cable with female terminals and white connector. 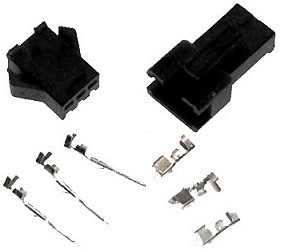 Wire connector mates with connector CNX-52. Standard half length throttle. Fits 7/8" (22mm) handlebars. Wire colors: black, red, and green. 62" long throttle cable with male terminals for white wire connectors. The most common connector used with this throttle is CNX-52. Standard half length throttle. Fits 7/8" (22mm) handlebars. Wire colors: black, red, and green. 62" long throttle cable with 3 pin black throttle to speed controller connector. The most common connector used in conjunction with this throttle is CNX-63. 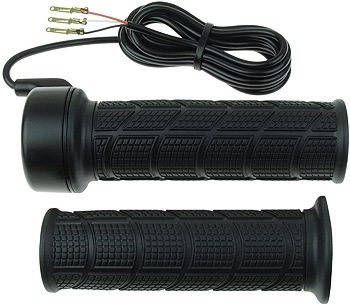 Standard half length throttle with latching push-button switch. Fits 7/8" (22mm) handlebars. 62" long throttle cable. Wire colors: black, red, white, yellow, and green. 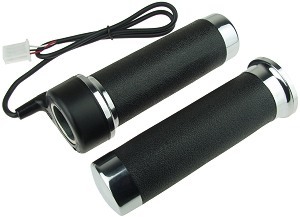 Set of two handlebar grips for use with the half length twist throttles sold above. The long grip is 4-1/4" and the short grip is 2-1/2". Standard thumb throttle. Designed to be installed on the right hand side of handlebars. Fits 7/8" (22mm) handlebars. Wire colors: black, red, and white. 62" long throttle cable with 2.8mm male terminals for white wire connectors. The most common connector for this throttle is CNX-52. Standard thumb throttle. Designed to be installed on the right hand side of handlebars. Fits 7/8" (22mm) handlebars. Wire colors: black, red, and white. 62" long throttle cable with female terminals for black wire connectors. 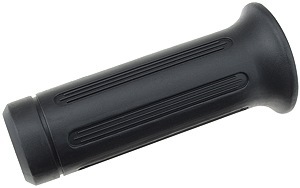 The most common connector for this throttle is CNX-63. Standard thumb throttle. Designed to be installed on the left hand side of handlebars. Fits 7/8" (22mm) handlebars. Wire colors: black, red, and white. 62" long throttle cable with 2.8mm male terminals for white wire connectors. The most common connector for this throttle is CNX-52. Handlebar grip without inside flange. 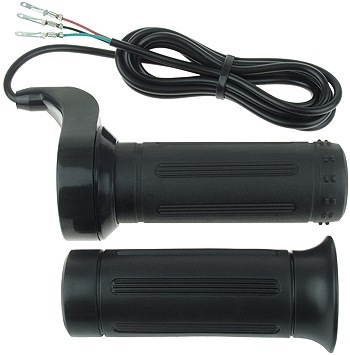 Designed specifically for use with thumb throttle item # THR-38 and item # THR-40. 3-3/4" grip length. 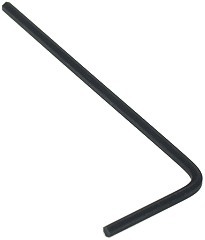 Fits 7/8" (22mm) handlebars. Left hand grip with inside flange. 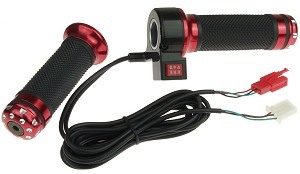 Matching left hand grip for GRP-12T thumb throttle handlebar grip sold above. 3-7/8" grip length. 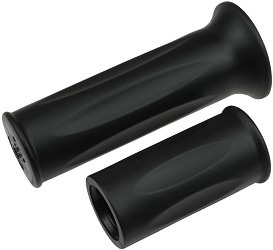 Fits 7/8" (22mm) handlebars. 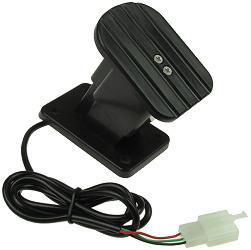 Premium heavy-duty foot pedal throttle. 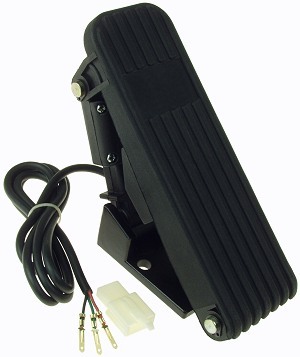 This foot throttle has the largest pedal and smoothest pedal response feel of any of our foot throttles. Made from reinforced nylon and cast aluminum with electroplated steel fasteners. 7" long x 2-3/16" wide throttle pedal. Mounting plate on bottom of throttle measures 3-3/8" X 2-3/16". 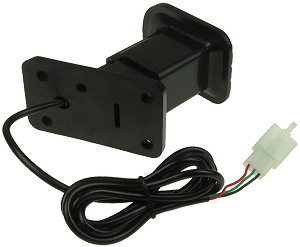 Mounts onto any flat surface with two 5/16" ID mounting holes. IP64 rated dust proof and water splash proof construction. 59" long throttle cable. Wire colors: red, black, and green. White wire connector mates with item # CNX-52. 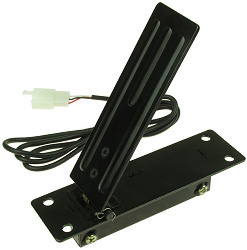 Heavy-duty plastic foot pedal throttle. Wire colors: black, red, and green. 49" long throttle cable with 3 pin white throttle to speed controller connector. Overall dimensions are 3-5/8" tall x 3-1/8" long x 2" wide. Four 1/4" ID mounting holes. Base measures 3-1/8" long x 1-3/4" wide. 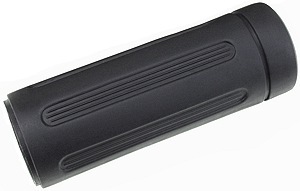 Base and footplate are made from 1/4" thick plastic. White wire connector mates with item # CNX-52. 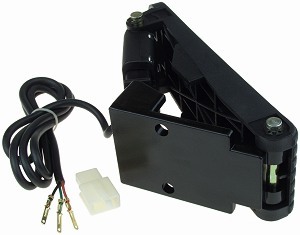 Heavy-duty all-steel foot pedal throttle. Wire colors: black, red and white. 49" long throttle cable with 3 pin white throttle to speed controller connector. Overall dimensions are 5-1/2" long x 1-1/2" wide. Four 1/4" ID mounting holes. Fits into 4" long x 7/8" wide rectangular mounting hole. Heavy-duty design - made from 1/16" thick plate steel. White wire connector mates with item # CNX-52. 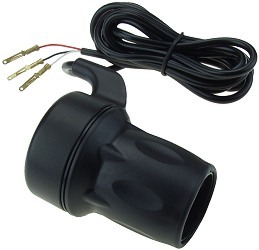 Heavy-duty cable pull throttle. Great for converting scooters, motorcycles, dirt bikes, mini bikes, and go karts from gas to electric power. Body is made from tough reinforced nylon. Body dimensions are 5-1/8" long x 1-1/4: wide x 3/4" high. Body has four 0.16" ID (4.1mm) mounting holes that #8 machine screws fit through. 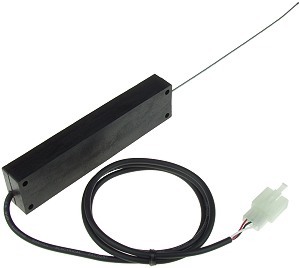 Pull cable is 6" long and has a 0.06" (1.5mm) diameter. Cable pull distance is 1". Variable speed throttle is at zero when cable is released and at full when cable is pulled out 1". Cable has stopper that prevents it from being pulled out of the body. 35" long electrical cable. Wire colors: red, black, and white. 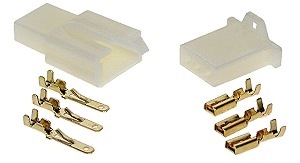 White wire connector mates with item # CNX-52. Cable clamp for cable pull throttle sold above. Connects two throttle cables together. 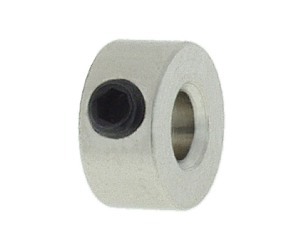 0.122" (3.1mm) ID x 0.315" (8mm) OD. Made from nickel plated steel. Includes socket set screw. Socket set screw requires 1.5mm Allen (hex) wrench to tighten and loosen. Cable clamp for cable pull throttle sold above. Connects two throttle cables together. 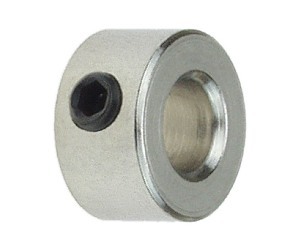 0.161" (4.1mm) ID x 0.35" (9mm) OD. Made from nickel plated steel. Includes socket set screw. Socket set screw requires 1.5mm Allen (hex) wrench to tighten and loosen. Throttle extension cable with 3 terminal white connectors. 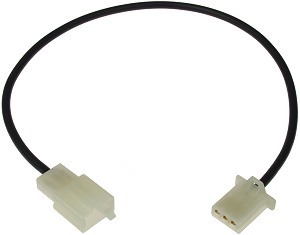 Extends the cable length of throttles sold above that mate with connector item # CNX-52. Available in 1 foot, 2 foot, 3 foot, 4 foot, and 5 foot lengths. Longer cable lengths are available on request. 3 pin white throttle to speed controller wire connector set with 6 matching terminals. 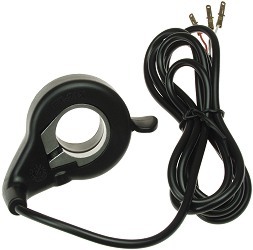 3 pin black throttle to speed controller wire connector set with 6 matching terminals. 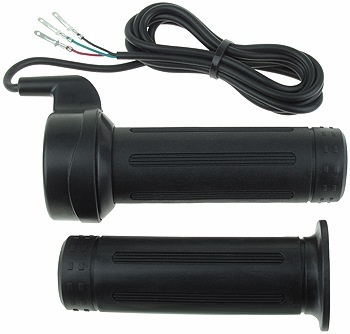 Electric Scooter Parts stocks standard universal throttles for electric scooters, electric bicycles, electric dirt bikes, electric go karts, electric ATV's, and most other types of small light weight electric vehicles.